Bollywood actor Kareena Kapoor Khan, who is set for a silver screen comeback after the birth of her son, Taimur, with Veere Di Wedding, has often shattered body stereotypes and she is at it again. In a new still from her upcoming film going viral online, Kareena flaunts her perfect bod in a colourful crop top and a stylish jacket. Kareena plays the central character in the film -- a woman who is getting married, though she is yet to come to terms with the conditions of commitments and emotional baggage attached with a traditional Indian wedding. She was last seen in R Balki's Ki and Ka opposite Arjun Kapoor and Abhishek Choubey’s Udta Punjab (2016). Kareena claims she liked the film as soon as she read the script. Talking about getting back to work after pregnancy, she said at the film’s trailer launch, “I’m very lucky to have a husband who is so understanding. It’s Saif Ali Khan who kind of pushed me to hit the gym and work and set an example to a lot of mothers.” Veere Di Wedding also stars Sonam Kapoor, Swara Bhaskar, Shikha Talsania and Sumeet Vyas in lead roles. The film has been shot across Delhi, Mumbai and Phuket. Choreographer Farah Khan has worked on a song for the film that also features Punjabi rapper Badshah. Directed by Shashanka Ghosh, it will hit the screens on June 1. 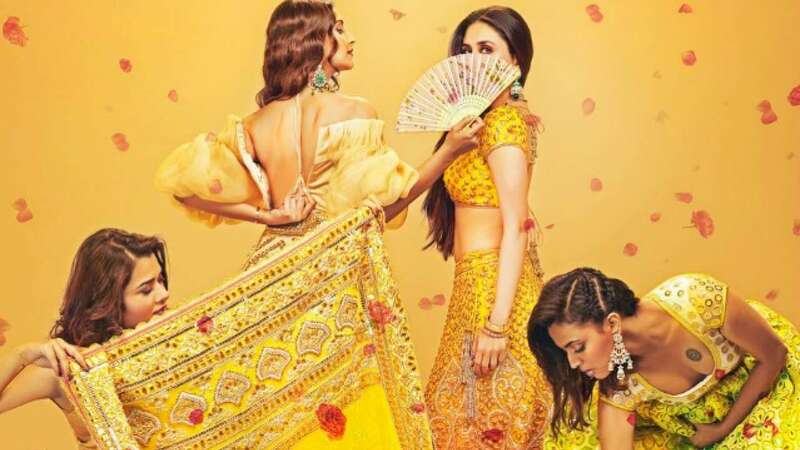 Bollywood actors Sonam Kapoor and Kareena Kapoor Khan are leaving no stone unturned to make the trailer launch of their upcoming film, Veere Di Wedding, a grand event. Photographer Manav Mangalani has posted pictures and videos from the event in which Kareena and Sonam can be seen arriving at the event. Veere Di Wedding, directed by Shashanka Ghosh, also features Swara Bhaskar and Shikha Talsania in important roles. Shashanka and Sonam have earlier worked together in 2015 film Khoobsurat. In a way, the commercial success of Khoobsurat saw a turnaround in Sonam’s career who went on to work in films like Neerja and PadMan. Veere Di Wedding is also Sonam Kapoor’s home production venture, and she ensured a smooth shooting schedule for the film. Incidentally, this is also going to be Kareena Kapoor’s first release post pregnancy. She was last seen in 2016 film Udta Punjab. Expected to be a light-hearted comedy, Veere Di Wedding is the story of four friends who come together for a lavish wedding. The team of Veere Di Wedding started shooting in September, 2017, and toured three cities -- Delhi, Mumbai and Phuket -- to complete the project. Ekta Kapoor, film’s producer, in an earlier interview to ANI, said, “This is definitely going to be a wedding to remember.” Veere Di Wedding will hit the screens on June 1, 2018.